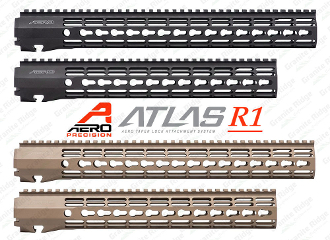 The ATLAS R-ONE is the newest addition to the Aero Precision Handguard lineup. Machined from 6061-T6 Aluminum, the R-ONE line of handguards are designed with size and weight in mind, providing the perfect handguard for your lightweight build. Our proprietary ATLAS attachment system is a durable and dependable mounting platform, maintaining a slim profile while still providing the strength and stability customers have grown to love from Aero Precision handguards. Available in KeyMod and M-LOK® profiles with 12" and 15" options (7" and 9" options coming soon). ATLAS Handguards are designed to match seamlessly with our M4E1 Threaded Upper Receivers. Additionally, they are compatible with any Mil-Spec AR-15 upper receivers as well. However, they may not be compatible with billet upper receivers due to indexing tabs. Please note: The ATLAS Handguards are NOT compatible with the Aero Precision M4E1 Enhanced Upper Receivers. 7" - 7.25", 9" - 9.19", 12" - 12.56", 15" - 14.94"
Aero Precision rail lengths measure from end to end. This is the point of contact at the receiver to the end of the last picatinny slot at the muzzle.